This complete system will be Supplied and designed by the Irish Manufacturer Dimplex. Our environment is full of energy, even at sub-zero temperatures there is plenty of energy available. Heat pumps extract the sun’s energy stored in the environment and raise it to a temperature suitable for heating purposes. This principle works even in the middle of winter at temperatures as low as -25°C. All Dimplex heat pumps produce significantly more renewable energy (up to 5 times) than the electricity required to power them, saving you money. Because they operate at between 55 and 70 degrees centigrade, they work best with low carbon. low cost heating systems such as underfloor and Dimplex SmartRads, which can heat your home effectively at lower water temperatures that conventional radiators. Air Source Heat Pumps extract heat from the outside air and using sophisticated heat exchangers this heat is transferred into your home. They usually require an external unit collecting ambient heat from the outside air which is then transferred to an internal unit which uses the refridgerant cycle to transfer the heat into a ‘wet’ central heating and hot water system. - Market leading Dimplex models can reach higher water temperatures, up to 70 degrees, enabling better use with radiators. Dimplex A Class comes in a range of pre-configured, system package options. Carefully specified for both new build and existing homes, these include all ancillary parts needed for a quick and hassle-free installation. Dimplex A Class is designed specifically to maximise year-round heating system efficiency, no matter the weather conditions. It outperforms Ireland’s leading heat pumps and the efficiency assumptions in the industry best-practice Heat Emitter Guide. As a result, Dimplex A Class will achieve a higher Seasonal Performance Factor (SPF) than other heat pumps at similar water flow temperatures. And better efficiency means lower running costs and a faster payback for the homeowner. 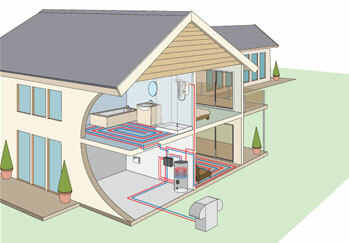 Dimplex Ground Source Heat Pumps work by absorbing the heat from the sun that is stored in the earth. They use a system of pipes containing fluid that are buried underground which absorb geothermal heat and then carry it into your home. - Arguably lowest and most consistent running costs. - Pipes can be laid horizontally or vertically.